Where can I find the beds? Those look like antique bed that have been reupholstered in fabric to match the room. Search antique stores or online for "French Louis XV beds." J'ai trois chambres avec de la toile de jouy,elles ont toutes un charme fou....j'ai acheté mes tissus en France,c'est difficile d'en trouver aux US. does anyone know the name and make of this toile pattern? Rooms with slanted walls and ceilings are already unique and special, so play that up. Wallpaper everything—the walls, the ceiling—there are no rules. Have fun! 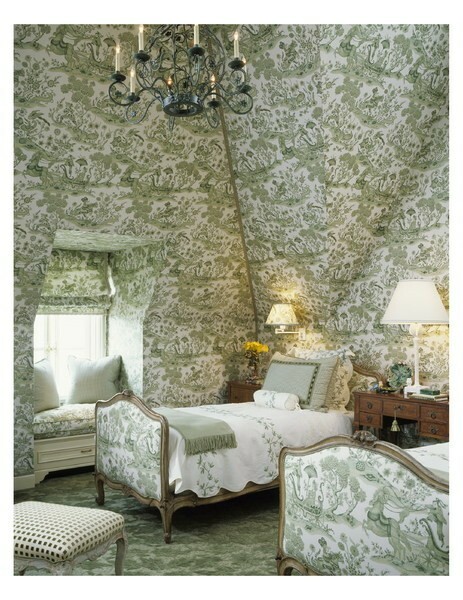 One of the most memorable bedrooms I've ever seen was covered floor to ceiling in blue and white toile. The color may be different here, but the effect is similar — like being wrapped in a grandmother's hug. wallpaper everything all the way up!! how cozy..
Eliana P. added this to Assignment #1 "principles and elements of design"